Beautiful, detailed graphics coupled with a Tim-Burtonesque soundtrack and a great storyline makes 10tons newly released marble shooter game, Sparkle, for the iPhone a must-have. This action puzzler for the iPhone is an adapted version of a game that was once only available for the PC and Mac. Users will travel through Crowberry Woods and bring “sparkle” or light back to a forest blanketed by darkness. In each level, the goal is to shatter the orbs of darkness with an orb slinger and avoid allowing the orbs to fall into the abyss. Tap where you want the orb to land and the orb slinger will banish the orbs of darkness. When you match 3 or more orbs of the same color, they will vanish. You will also receive power-ups when you match several rows. There are different power-ups that you can gain and 10 different amulets you can (win) and wear to change the rules of the game. Users also have the chance to unlock 12 secrets within the woods (see the butterflies) and play 3 different game modes: quest, challenges, and survival. At first the game background looks dark, but the more levels you advance the sparklier the scene becomes. The graphics are amazing and very sharp. Although it takes awhile to advance to different levels, the ability to gain extra lives was appreciated so you don’t have to immediately start all over again if you die. Sparkle is highly addictive and has great replay potential–after downloading it, I played for three hours straight. The game becomes more challenging the longer you play with different arrangements and speed of the orb course. The game is also easy to follow and the tutorial was short but comprehensive. I especially enjoyed how responsive the game was when I tapped the screen to launch orbs. Some users had problems with the different backgrounds being too dark, but I didn’t have any problems. Others complained of growing tired of the time required to advance to different levels and the effort needed to collect amulets. Look elsewhere if you need instant satisfaction. Sparkle may be challenging but the rewards are well worth it. There were also complaints made on behalf of red-green colorblind users. Perhaps developers might reconsider the color choice in the game as a fix to this problem? Sparkle has wonderful details and exciting gameplay. Those who don’t want to commit to buying just yet, should consider trying the game out on their PC or Mac before purchasing. Demos might be available online. 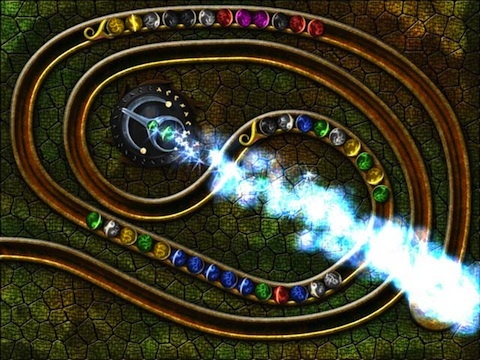 For marble shooter fans and die-hards, Sparkle is a must buy especially after the price drop from $2.99 to $0.99. That’s a steal. Grab it before the price rises again! AppSafari review of Sparkle the game was written by Linda Ta on March 12th, 2010 and categorized under Action, App Store, Fun, Games. Page viewed 3461 times, 1 so far today. Need help on using these apps? Please read the Help Page.